The master bath has a floor-to-ceiling window overlooking Gramercy Park, Manhattan's only private park. 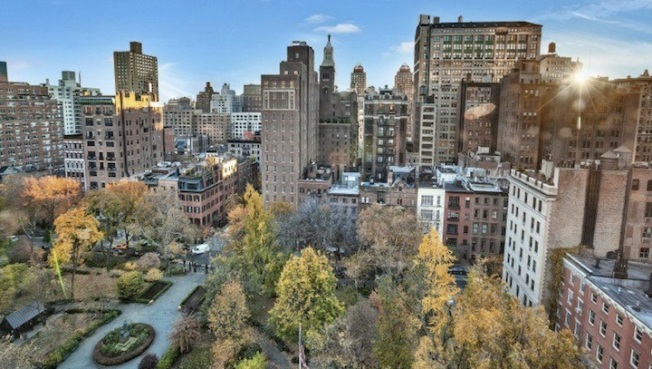 A ninth-floor aerie on Gramercy Park owned by Ed Snider, the chairman of Comcast Spectacor and owner of the Philadelphia Flyers, is set to enter the market at $8.75 million, reports the New York Times. The home has a loftlike great room with a 22-foot expanse of 12.4 feet ceilings, floor-to-ceiling windows, and a wood-burning fireplace, plus custom waxed-plaster walls. The kitchen boasts Miele appliances, a large stone center island, a built-in banquette, and lacquered resin cabinetry. The master suite has a sycamore walk-in closet and the master bath has a floor-to-ceiling window overlooking Gramercy Park, Manhattan's only private park. The building amenities offer a gym membership to the hotel's gym, and room service from restaurateur Danny Meyer. The monthly maintenance fee is $11,528. Snider paid $7 million for the "wow factor" heavy apartment three years ago.